Steven Morrissey says he was “blown away” when he encountered the community housing sector twelve months ago. On the brink of becoming SouthEast Housing Co-op’s new CEO, he said he hadn’t realised “how important” the sector was (this observation perhaps confident that community housing still hides its light under a bushel). But now he is a serious convert and says his mission is to pull out all stops to foster its growth. One of three boys, Steven grew up in Melbourne but spent most of his adult life in Gippsland. With a lifelong love of the great outdoors he now lives in Warragul, which gives him ready access to some of Victoria’s remoter locations. Luckily his wife, a “local girl”, shares his enthusiasm for fishing – he laughs that they spent their honeymoon in a campervan travelling around Tasmania doing (mostly) just that! Steven had by now developed a strong commitment to the not for profit sector and knew that this was where his future lay. Although asserting that he’s not really sure what the source of this impulse might be, he goes on to admit that his mum, the “communist” in the family (nickname ‘Kamerad Robski’), is a card carrying member of the ALP within whom resides a steadfast social conscience (quirkily combined with a love of French Champagne). An employment enterprise which offered jobs for those with a disability was his next professional port of call. Also based in the Latrobe Valley, this could seem like an impossible gig, given the ever rising level of unemployment amongst the “mainstream” population, particularly young people. But against the odds, Latrobe Valley Enterprises has established what have now become four highly successful businesses. Paper recycling, sign making and business support services. The fourth venture, Gippsland’s Grounds Maintenance, was inundated with work after the bushfire and has recently landed a big contract with Telstra to provide its services from Wonthaggi through to the NSW border. These enterprises are a great mix as they offer a wide range of opportunities to those with physical and intellectual disabilities’. 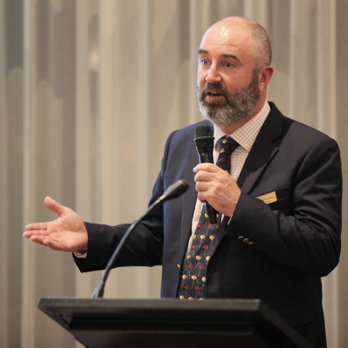 SouthEast’s CEO says that his many years of working in not for profit and with community based boards of management have equipped him well to deal with the often robust debates that characterise co-op’s governing bodies. There has been much discussion of late about how to manage downsizing – a complex “asset management” issue that affects not just co-ops but the whole community housing sector as a generation of children leave home. But while empty nesters will be encouraged to occupy smaller dwellings as these come on line, there will be no “pitch forking” of tenants out of properties at SouthEast, he says. Rather, the co-op has embarked on an education process to help everyone understand the issue and how they may be able to help as their family circumstances change. has so far eluded him. Steven’s matter-of-fact response to critics of the sport is that, “if you’re going to eat meat, something’s got to die.” Both his daughters are also excellent shots. Back on the work front, the co-op’s CEO observes that what goes around invariably comes around. It turns out that his experience as a tradie and electrical contractor has proved invaluable in the context of the co-op as it means that he can readily evaluate properties, has a handle on costs and understands how the building industry works. He expresses confidence that these skills will contribute to the organisation’s ability to be “nimble”, which in turn should translate into growth for SouthEast Housing (the co-op has acquired four new properties this year via support from the state government’s Rapid Housing Assistance Fund. Certainly, in an environment where the public purse is otherwise limited, this newcomer to the business of community housing displays all the right qualities. Steven is at once pragmatic – not being hidebound by old funding paradigms – and refreshingly optimistic. His relatively recent introduction to the sector and his “surprise at how many people had a roof over their heads who may otherwise have been homeless,” has been a spur to action that may be the envy of a more seasoned community housing manager.